Show attendees at Geena Matuson's (@geenamatuson) TransFIREmation Gallery Show & Installation in the MassArt Student Life Gallery, 2013. 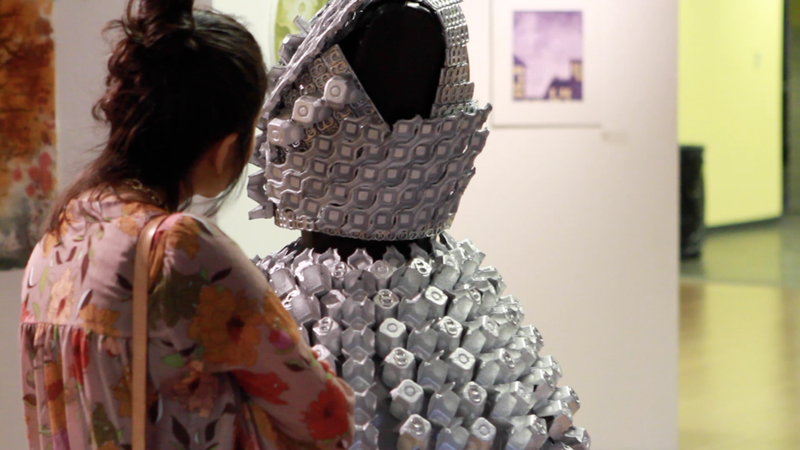 Though the show has been up all week, the reception was set to start at 7pm - and everyone from MassArt filtered out of their 6 o'clock class and into the Student Life Gallery. It was packed! "TransFIREmation is an art exhibition produced, curated by and featuring recent works of Geena Matuson from her 'Liar Liar' (2013) series. TransFIREmation group gallery show features MassArt Undergraduate 2D work, sculpture and video installation with a focus on fire, masks and the moon - all with a theme of transformation..."
'Invisible Smoke I' and 'Invisible Smoke II' by Your Imagination (Geena Matuson) at her at Geena Matuson's (@geenamatuson) TransFIREmation Gallery Show & Installation in the MassArt Student Life Gallery, 2013. While the rush came when class got out around 6:30 and thinned, people were in and out until the gallery closed for the night. I needed to fill-in some space by the windows, so I setup two pedestals and labeled them as if displaying art, 'Invisible Smoke I' and 'Invisible Smoke II' by Your Imagination. Apparently, quite a few people found this amusing! 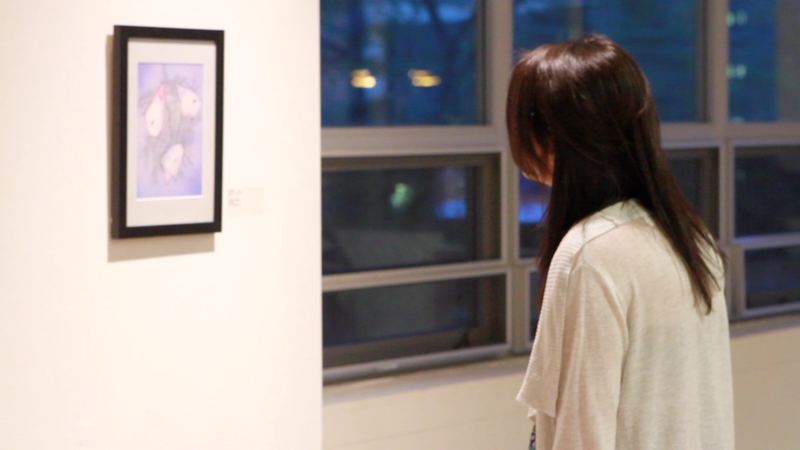 We also got a few shots of the artists beside their work, check out the mini-slideshow. 'New Moon I' and 'New Moon II' by Shannon Knight at Geena Matuson's (@geenamatuson) TransFIREmation Gallery Show & Installation in the MassArt Student Life Gallery in Boston, MA, US. 'Terror on Tashirojima Island' by Christina Kelly at Geena Matuson's (@geenamatuson) TransFIREmation Gallery Show & Installation in the MassArt Student Life Gallery in Boston, MA, US. 'Leporidae 3' by Rachel Stanton at Geena Matuson's (@geenamatuson) TransFIREmation Gallery Show & Installation in the MassArt Student Life Gallery in Boston, MA, US. 'Leopard Society' by Tiffany Chan at Geena Matuson's (@geenamatuson) TransFIREmation Gallery Show & Installation in the MassArt Student Life Gallery in Boston, MA, US. 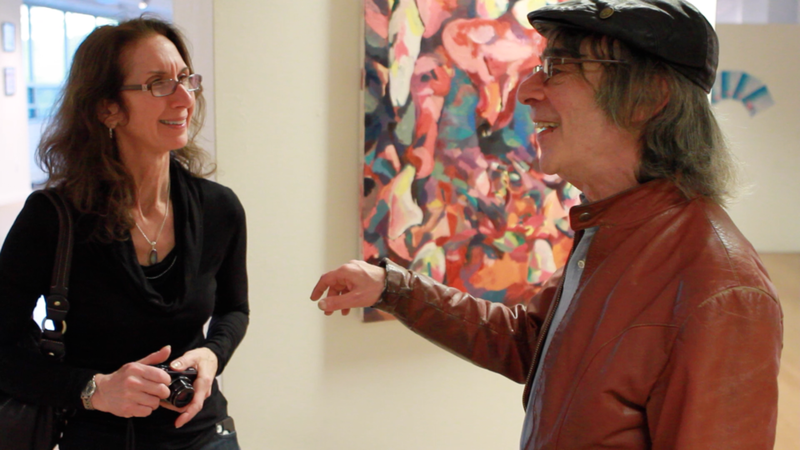 Geena Matuson (@geenamatuson) with MassArt Professor of Film/Video Saul Levine at Matuson's exhibition 'TransFIREmation', 2013. 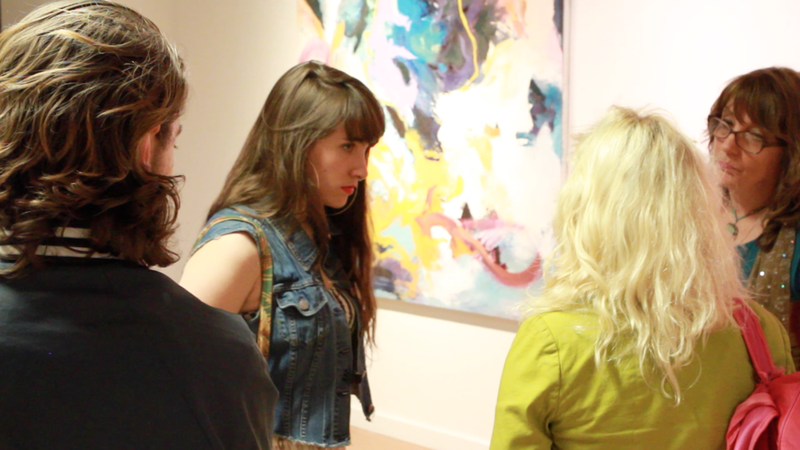 Artist Sydney Schofield at Geena Matuson's (@geenamatuson) TransFIREmation Gallery Show at MassArt, 2013. Some viewers check out the trailer and art prints from my short film 'My Big Bad Wolf' (2013), nearing completion for its May premiere! Artist Sydney Schofield photographed other artists looking at her sculpture piece Untitled (Suspended Progression). It's hand-dyed yarn and rope hanging 33". Emelie Bergh's fashion and fiber's dress 'Craters' made out of egg cartons, soda tabs and screen mesh was gaining quite a bit of attention! Andrew Brown at Geena Matuson's (@geenamatuson) TransFIREmation Gallery Show & Installation in the MassArt Student Life Gallery, 2013. Devon Fisher speaks with Geena Matuson (@geenamatuson) at her TransFIREmation Gallery Show & Installation in the MassArt Student Life Gallery, 2013. Jeremy Day watches 'Liar Liar, Pants on Fire' at Geena Matuson's (@geenamatuson) TransFIREmation Gallery Show & Installation in the MassArt Student Life Gallery, 2013. I chatted with Devon Fisher from Moth Vegas, the band creating the soundtrack for my thesis film 'My Big Bad Wolf' (2013), and Jeremy watches my projection 'Liar Liar' - an extended piece not found online. 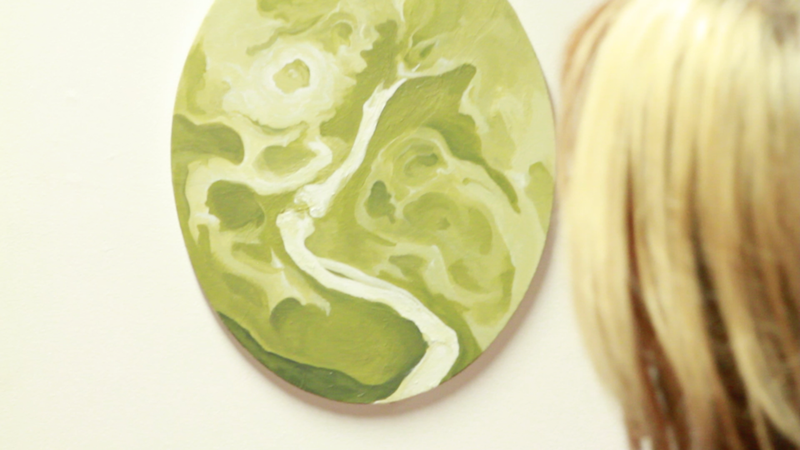 And, I seemed to match painter Carly Sheehan's painting! 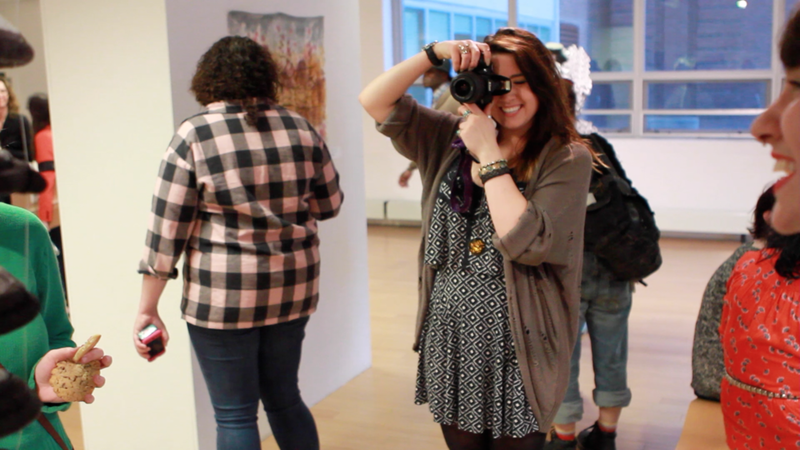 Geena Matuson (@geenamatuson) at her TransFIREmation Gallery Show & Installation in the MassArt Student Life Gallery, 2013. You can see more from my 'Liar Liar' series and 'My Big Bad Wolf' on my website.